C.S.I. 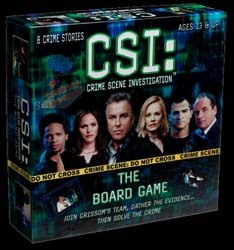 Crime Scene Investigation: The Board Game is an exciting and challenging crime solving board game that includes forensic cards, arrest warrants and evidence cards. Obvious comparisons are likely to be drawn with the old family favourite Cludeo. However, C.S.I. offers a lot more. 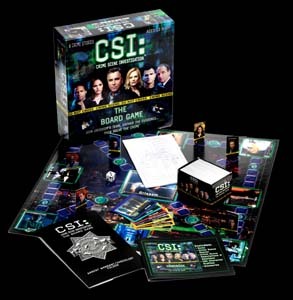 Sure, you have to move around the board collecting evidence before you rush to Grissom with your proof for who committed the crime, and how, but it is more complex than Cluedo. You'll also need to carefully go through the instruction manual, because there is a lot to take in before you can start to play the game - and you know how everyone likes to argue over the rules. The only slight problem is that I was hoping there would have been a few more crimes to solve than the eight that are included. While these can be played again and again, it would have helped to have a bit more variety. Fans of the TV series may not find this as exciting as the TV series, but it is the next best thing to starring in your open episode of C.S.I.